NEW YORK (CNS) — The seemingly ever-expanding media universe centered on Marvel Comics spawns yet another property with the arrival of the so-so sequel “Avengers: Age of Ultron” (Disney). Occasional flashes of wit relieve the endless succession of explosive special effects in writer-director Joss Whedon’s follow-up to his 2012 adventure “The Avengers.” But, for a variety of reasons, parents should be at least as wary of this outing as they were of its predecessor. To his credit, Whedon keeps the mayhem stylized as he reunites the titular team of superheroes to face their latest problem: a supposedly peaceable tech project undertaken by uber-engineer Tony Stark, aka Iron Man (Robert Downey Jr.), that’s gone horribly awry. 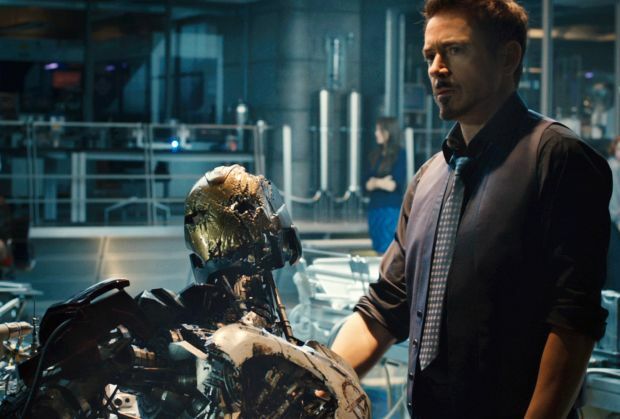 The unintended result of Stark’s tinkering is Ultron (voice of James Spader), an artificial intelligence-guided villain who can self-replicate at will. To defeat this swarming, homegrown foe, Stark’s colleagues — Thor (Chris Hemsworth), Hulk (Mark Ruffalo), Captain America (Chris Evans), Black Widow (Scarlett Johansson) and Hawkeye (Jeremy Renner) — will need to overcome their petty rivalries. All the more so, since Ultron is being aided by superpower-wielding twins Pietro (Aaron Taylor-Johnson) and Wanda (Elizabeth Olsen) Maximoff. This Eastern Europe-bred duo — alternatively dubbed Quicksilver and Scarlet Witch — nurse a long-standing grudge against the film’s ensemble of good guys. Their shared resentment originates in an incident from their childhood that would seem to parallel the NATO bombing of the former Yugoslavia during the Kosovo war of the 1990s. What we’re meant to make of this implicit allusion to real-life events, however, remains unclear. There’s a lot of that sort of ambiguity going around, especially given the muddled approach Whedon’s script takes to its under-realized main theme: the apparent opposition between human freedom and the blessings of tranquility. His consciousness partly shaped by the darker aspects of his unwitting creator’s cynical worldview, Ultron believes the only solution to humanity’s incurable aggressiveness may be the elimination of the species as a whole. Is this annihilating outlook meant to serve as anything more than a convenient means of raising the stakes in Ultron’s confrontation with the Avengers to a planetary level? It’s hard to judge. More obvious are the dings in the movie’s moral surface. These include a number of less-than-heroic exclamations and a couple of ill-considered jokes. The latter defects include a remark about Ultron “multiplying faster than a Catholic rabbit.” While Whedon may be able to claim a vaguely pontifical pedigree for that one-liner, taken together with the other elements listed below, it renders his picture inappropriate for impressionable youngsters. The film contains pervasive but bloodless violence, brief irreverent and anti-Catholic humor, fleeting sexual banter and some crude and crass language. The Catholic News Service classification is A-III — adults. The Motion Picture Association of America rating is PG-13 — parents strongly cautioned. Some material may be inappropriate for children under 13.